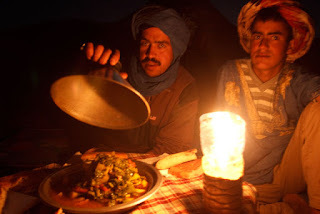 One of my favourite experiences in Morocco was an overnight stay in Erg Chebbi. 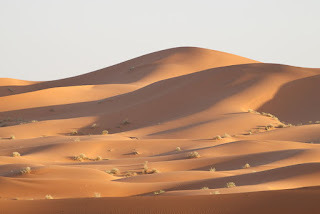 Situated in/beside the village of Merzouga and Hassi Labied, Erg Chebbi is a sand dune rising 160+m high. 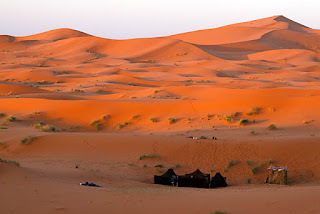 Several guesthouses/establishments have setup semi-permanent camp deep into these dunes, and arranging an overnight stay in these is one of the ways to enjoy the magic of the dunes. Many many guides/agencies are available for arranging trips to the dunes. 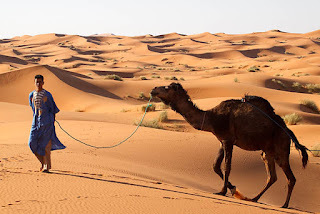 They are available in the villages Merzouga and Hassi Labied, further in the town of Rissani, and even as far as Er-Rachidia. 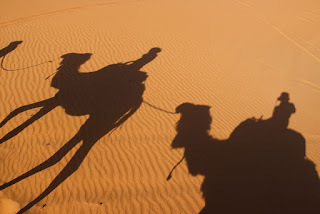 There are camel treks into the dunes, 4WD and even quad tours into the dunes. However, the quads and 4WDs are pretty noisy, and one of the magic of experiencing the dunes is the serenity and quiet of the place. Most of these seems to operate near the edge of the dunes, so, my recommendation is to spend the night deeper into the dunes, away from the crowd.